One of the primary reasons people execute a power of attorney is so someone else can manage some of their financial transactions. 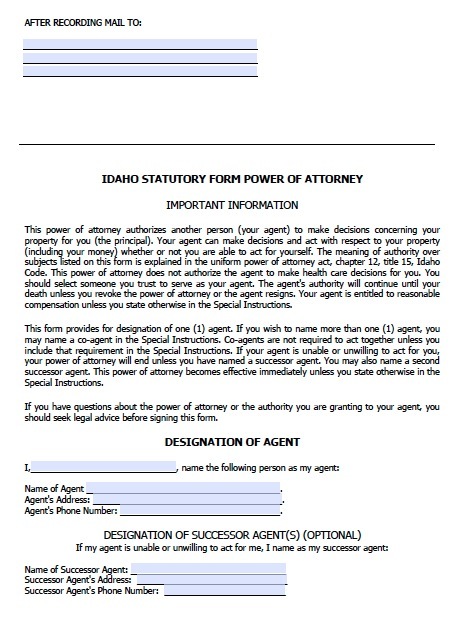 In Idaho, you can grant an agent general authority to act for you regarding almost all of your financial matters, including real estate, personal property, bank accounts, operation of a business, litigation, and governmental benefits, among others. Or you can enable the agent to handle only one or a combination of these matters, for example, you can merely authorize the agent to pay your bills for a set period. Because agents can have so much power over your financial affairs, it is critical to grant this power only to someone you have the utmost trust in, and you must thoroughly discuss your financial plans with your agent. When you sign and execute the agreement, it imposes legal duties upon the agent. These include the duty to act in good faith, which means acting in the principal’s interest and with no intention to defraud, the duty to do what the principal reasonable expects you to do, and the duty to disclose your identity as the agent whenever you act for the principal, among other duties.